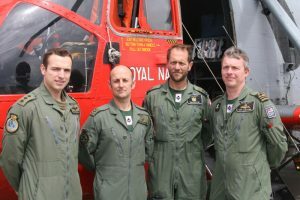 A helicopter crew from a Royal Naval Air Station in Cornwall has been recognised for courage, leadership and outstanding teamwork after undertaking an air/sea rescue in dangerous sea conditions. At 2113 on Thursday 7 July 2011, ‘Rescue 193’ from 771 Naval Air Squadron was scrambled to assist the yacht Andriette, which had lost steerage in the rough seas 75 nautical miles south west of the Isles of Scilly. The engine was unserviceable and the sails could not be hoisted so the two crew members abandoned the yacht for their life-raft. Rescue 193 battled strong headwinds and heavy rain squalls to reach Andriette where Captain Martyn Roskilly RM skilfully established a 70 ft hover over the life-raft in atrocious conditions and the Observer, Lieutenant Jason Sawyer RN, lowered Winchman Sergeant Antony Russell RM into the darkness. With heavy seas and disabled voice communications, Sergeant Russell used hand signals to direct the Observer. Battling against the elements Russell hauled himself into the raft, secured his rescue strops and signalled to the aircraft to recover him and the crewman. However, as they rose towards the aircraft a large wave capsized the life-raft and the remaining survivor was lost from sight. Sergeant Russell was lowered again to the life-raft. There was no sign of the survivor so, without hesitation, he dived under the raft, surfaced in an air pocket and found him there. As he submerged briefly in an attempt to return to the surface to signal that all was well, the panicked survivor gripped Russell’s arm, preventing him from surfacing. Trapped underwater, Sergeant Russell fought for breath before managing to rejoin the survivor in the air pocket. A few anxious minutes passed before Lieutenant Commander Luscombe directed the crew to raise the winch to regain visual contact with their Winchman. After further difficulty caused by the atrocious weather and sea conditions Russell managed to secure the survivor in a rescue strop and lifted him to safety. Master Aircrewman Richard Taylor, from RAF Valley in Anglesey Wales, was presented with an Individual Commendation at the ceremony which recognises the UK’s unsung heroes who risk their lives in dangerous sea and air rescues. In the early hours of the 27th November 2011, the crew of ‘Rescue 122’, piloted by Flight Lieutenant Thomas Bunn RAF, the Aircraft Commander, and co-piloted by Flight Lieutenant William Wales RAF, launched a search and rescue mission after the ship MV Swanland broke in two and sank in stormy conditions, forcing the survivors to abandon the ship in dinghies. After locating the wreckage and one of the dinghies with two survivors in it the difficult decision was taken to delay their rescue and search for others who might be injured in their dinghies or struggling in the open sea. A second dinghy was located and although scanning equipment showed no survivors it was decided that it should be searched anyway to make sure. Master Aircrewman Richard Taylor was winched down to search the second dinghy, but the high seas caused the winch operator’s system to malfunction throwing Master Aircrewman Taylor into the sea on several occasions. Undaunted he finally managed to get into the second dinghy to search for survivors but then a large wave flipped the dinghy over. Struggling for breath, he finally surfaced to find he had passed clean through to the other side of the dinghy still attached to the hoist cable. At this point he showed great mental and physical strength as, in order to free himself and the winch cable, he had to swim back through the dinghy before being winched clear. With no survivors found, the helicopter returned to the first dinghy where he recovered two survivors who mercifully were uninjured. 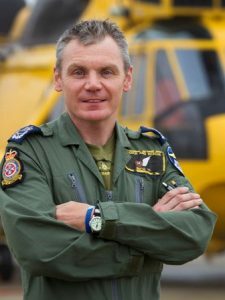 Master Aircrewman Richard Taylor has also been awarded a Queen’s Commendation for Bravery in the Air to add to the Queen’s Gallantry Medal he already holds. Helmsman Roger Jackson was presented with The Lady Swaythling Trophy at the Shipwrecked Mariners’ Society’s annual Skill and Gallantry Awards which recognise the UK’s unsung heroes who risk their lives in dangerous sea and air rescues. With four metre waves caused by a strong onshore wind blowing against the ebb tide and limited radio contact, locating the casualties was difficult. . 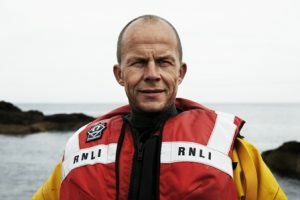 The crew were also fighting to keep their own lifeboat upright in the extreme conditions, while Helmsman Jackson negotiated the safest route using full power to climb the face of the very large waves, before punching through their crests, and then dropping steeply off their backs and into the trough behind. On reaching the distressed boat, Helmsman Jackson and his crew knew that they had little time in which to recover the four people who were clinging onto the wreckage, three of whom had no lifejackets, before they were separated and cast adrift in the stormy seas. Helmsman Jackson directed the casualties to swim to the lifeboat one at a time, as he skilfully manoeuvered his boat while anticipating the effects of the sea, avoiding debris in the water and timing it so that the recovery could be effected while both craft were between the wave crests. When all the casualties were on board the lifeboat began its dangerous journey back. Added to the problem of navigating the channel in such atrocious conditions with the weight of seven men onboard maintaining the trim was critical. The survivors were safely landed. 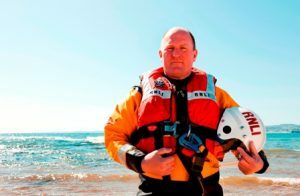 Helmsman Darren Crowe was presented with the Emile Robin Award for an outstanding sea rescue at The Shipwrecked Mariners’ Society’s annual Skill and Gallantry Awards which recognise the UK’s unsung heroes who risk their lives in dangerous sea and air rescues. On the morning of the 6th June 2011, Helmsman Darren Crowe, along with Alistair Crowe and former crew member James Crowe, launched the Inshore Lifeboat after the Coastguard was informed that a man had fallen into the sea at St Abbs Head and had been swept into Ty’s Tunnel by the powerful swell where he was clinging to a rock battered and bleeding. When the crew arrived at the site, they eventually spotted the injured man trapped beyond a narrow fissure in the rocks. The casualty was unresponsive and unable to swim out of the tunnel which could not be accessed by the lifeboat. The gulley is completely submerged at high water and with sea level on the rise the decision was made to swim into the tunnel to recover the man. The Helmsman took the decision to put Alistair Crowe at the helm so that he could swim in to the tunnel himself. For security a rope was tied to his life jacket and he entered the water for the 20 metre swim. Fighting against the swell and the weight of the rope, Helmsman Crowe was repeatedly swept into the rocks as he tried to reach the frightened man. He was having to time his entry to the tunnel to avoid the heavy swell. Once at his side, Crowe had to coax the man back into the water and then swam to the waiting life boat with the man’s arms gripped around his neck.